he had to leave for medical reasons. 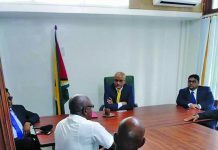 As the Preliminary Inquiry (PI) was about to commence, an attorney was also arrested by the Police for trying to interfere with the course of justice in what could be described as a day of high drama. 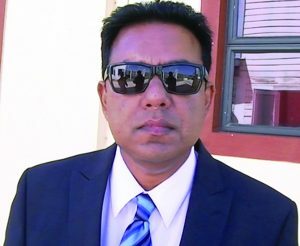 Attorney-at-Law Chandra Sohan was taken into custody after State Prosecutor Stacy Goodings accused him of obstructing the course of justice. 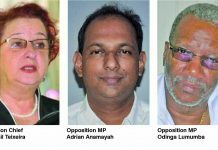 Attorney Sohan, who is not on record as representing the five accused, told the court that two witnesses who had previously testified did indicate to the court that they did not wish to rely on the further statements which they had given to the Police, but on the first set. Sohan was doing was acting in the interest of the two witnesses. The two witnesses were initially picked up as suspects along with the five defendants and detained for four days. Sohan is alleging that after four days in custody, they were given statements to sign and were ordered to sign them if they wanted to be released. In the initial statements, those witnesses claimed that they knew nothing of the murder. The two in question are now witnesses for the State. Following the intervention by Sohan, he was arrested and taken into custody. The prosecution is contending that he was trying to persuade one or more witnesses to not tell the truth. The prosecution is pushing to have him charged. Meanwhile, Attorney-at-law Datadin told the court that he had reviewed a video, which was submitted by one of the persecution’s witnesses and challenged it in court on the grounds of its admissibility. The court is to also look at the video as the PI continues. 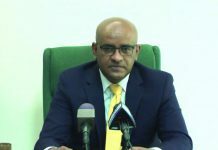 The five men charged: Radesh Motie, 39; Diadatt Datt, 18; Harri Paul Parsram, 49; Orlando Dickie and Niran Yacoob 37, are before the court for the November 1, 2016 killing of Faiyaz Narinedatt, a carpenter of Number 70 Village, Corentyne. 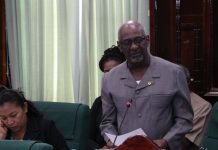 The State is contending that Narinedatt was killed and his body was subsequently placed along the Corentyne Highway at Number 70 Village and run over by a car to make it appear as if he was the victim of a hit-and-run accident. Bisram has since been arrested by law enforcement officials in New York and is being detained pending a hearing in a New York court. While Bisram’s relatives filled the courtroom, outside family members of the dead carpenter held a peaceful picket calling for justice. 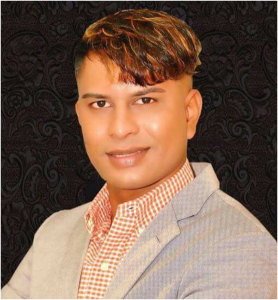 On Wednesday afternoon, habeas corpus proceedings were filed in the High Court in Georgetown for Sohan, who is a former magistrate released on his own recognisance. Following the filing of those proceedings by Attorney Sase Gunraj, the court ordered that the Police produce him at 09:30h today. However, the Police have since released him on his own recognisance.